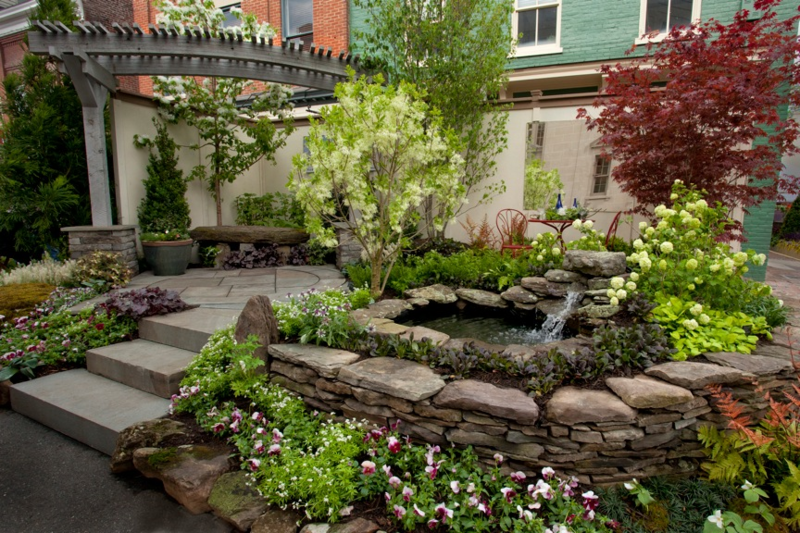 Come out and visit us at the 23rd Annual Leesburg Flower and Garden Festival on April 20 and 21. 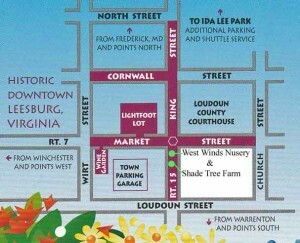 The streets of Old Towne Leesburg get shut down for this weekend event. It makes for a great weekend outing with the family, with activities for the little ones. 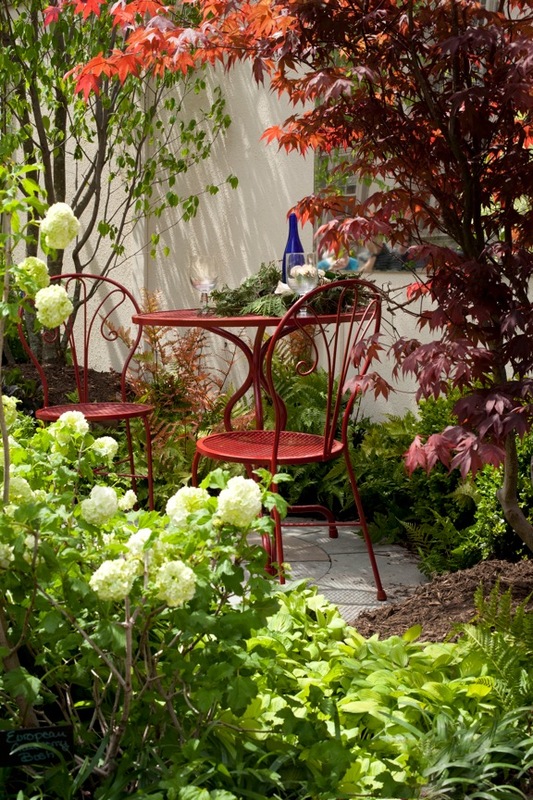 You will not want to miss West Winds Nursery’s award winning garden display. Last year West Winds Nursery won the prestigious Technical Landscape Award. This is the third year in a row West Winds Nursery’s garden display has been recognized as ‘best in show’ and this year will not be any different. “We were very proud to receive this recognition last year,” said Philip Klene, the owner of West Winds Nursery. Set-up for the competition starts at 6 pm on Friday night and will be completed by opening time on April 20 at 10 am. It makes for a very eventfull night for our workers. Check out our facebook page for updates throughout the night. Stop by and see some of our trees dug fresh out of the fields! …and enter our drawing to win your choice of lawn ornaments worth over $200. See the map to find us. We hope to see you there! This year there will be an expanded Wine Garden that will feature some of the best local wines and brews from the area. Also the Festival has expanded to Cornwall Street. Vox Populi is a semi–professional, mixed-voice vocal band based in the Washington, DC metropolitan area. Using only their voices to produce high quality a cappella music, each member brings their own unique sound and style to enhance your listening enjoyment. Our mission is to entertain audiences with soulful melodies, tight harmonies, and a beat that can’t be denied. Smooth sounds to have you grooving through the streets of Leesburg! The Crawdaddies are a very popular emerging artist from the East Coast whose music combines some of Louisiana’s Cajun / Zydeco / Blues sounds with North Eastern’s Roots Rock / Americana / Ska influences to create a very unique sound that is all its own. A local face and local sound that we are proud to have back at Flower and Garden! A Blues and rock band that play the panhandles of West Virginia and throughout NoVA. Songs range from blues to southern rock to classic rock with a little Jimmy Buffett, soul, swing and country mixed in. Sounds like a good time! Roots rock? Americana? Alt country? Blues? Psychobilly folk punk? Based in Loudoun County, Virginia, the collaborative adventure known as Orphans of Twang is a hard band to classify. From Al Green to Johnny Cash, Elmore James to Elvis Costello, Tom Waits to Talking Heads. No song is safe or sacred, and never played the same way twice — including our originals. Our unique sound blends Bakersfield, New Orleans, Memphis and SoHo — with a little Nashville and Chicago thrown in. Gary is a Flower and Garden veteran and a crowd favorite. His covers are spot on and he is always ready to show the crowd a good time!